This ancient name is of Franco-Germanic origins. There are several claimed meanings. The first and most likely, is that it is one of the several forms of a compound personal name of the pre 7th century based around the prefix 'haur', translating as 'the hawk', plus the suffix 'hard', which means what it says. Early German (Frankish) personal surnames were, like the Olde English and Viking of the 'Dark Ages', based around the concepts of personal glory from strength and godlike deeds. Furthermore particular animals were also considered to have these attributes, the eagle, the wolf, and the lion, being particular favourites both then and in the later medieval heraldry, to which these 'mythical' objects were also introduced. 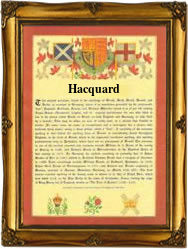 The French 'Dictionnaire etymologique' gives this name as being from Anjou, and recorded as Hacard, Hacquard, Haquard, and Hacaud, with the English Hachard, Hatchard, and Haggard being from the same source. However not only are the English recordings much earlier than the French, but the claim in England is that the name derives from the Old French 'hagard', meaning 'wild and untamed.' If this is correct then then origination was as a 'nickname', perhaps for an outlaw! Many French registers were lost in the upheaval of the Revolution of 1789 - 1794, and the following Napoleonic Wars ending in 1815, however two early recordings are those of Martin Hacard, a witness at the village of Avril, Meurthe et Moselle, on June 24th 1671, whilst on March 13th 1690, Jean Francois Hacquard was christened at Gerbeville, also Meurthe et Moselle. The first recorded spelling of the family name is shown to be that of Alice Haggard, which was dated 1275, in the Subsidy Rolls of the county of Worcester, England, during the reign of King Edward 1st, known as 'The hammer of the Scots,' 1272 - 1307. Surnames became necessary when governments introduced personal taxation. In England this was known as Poll Tax. Throughout the centuries, surnames in every country have continued to "develop" often leading to astonishing variants of the original spelling.